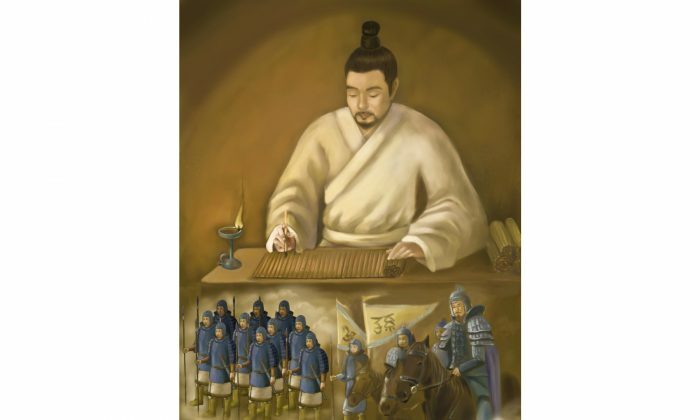 Sun Zi, also known as Sun Wu or Sun Tzu, was a high-ranking military general in Chinese history who is known for being one of the greatest military strategists of all time. Sun Zi’s real name was Sun Wu and he was born 535 B.C. Originally, he was a noble of the Kingdom of Qi in the late Spring and Autumn Period (770–481 B.C.). He moved to Kingdom Wu after war broke out in the Qi state. There, he lived a reclusive life, devoting himself to the study of the art of war. Around 512 B.C., Sun Zi began serving King Helü of Wu as a general and a strategist. His experience as a general prompted him to write down his strategies in the book The Art of War, a valuable Chinese military treatise. “The Art of War” became very well-known and was consulted and referred to often in later dynasties, especially in the tumultuous Warring States Period (475–221 B.C.) directly following the Spring and Autumn Period. The King immediately passed down an order to send 180 maids from his palace to act as the military. After the maids arrived, Sun Zi divided them into two teams and assigned two of the King’s favorite concubines to be the captain of each team. At first, the maids did not take Sun Zi seriously. When Sun Zi told them to face right, they only giggled and pushed each other around. Sun Zi asked the maids not to take the drill as a joke and warned them not to make mistakes otherwise they would be punished by military law. But he allowed that the maids may not have understood his instructions the first time. As the general, it was his responsibility to make sure his orders were clear. However, after the drill started again, the maids still laughed and paid no attention to Sun Zi. Sun Zi looked angrily at the captains and said to them, “Both of you, as a captain, failed to meet the duty of supervision and must accept the punishment.” Sun Zi then ordered the immediate execution of the King’s two favorite concubines. Though the King strongly protested, Sun Zi was steadfast, and so the two concubines were immediately executed by military orders. Hearing this, the king realized that Sun Zi was indeed an outstanding talent of the art of war. Sun Zi also explained that he did not defer to the king’s protests because, out on the battlefield, a general was the supreme commander. In the heat of battle on the front lines, not even the king can overturn a general’s orders. According to Sun Zi, the king must be able to trust in his generals completely and believe that they will do their duty no matter what. When Sun Zi returned to the drill, the maids obeyed his every command correctly and immediately. Sun Zi was then appointed as a general and afterwards conquered western Chu and the northern middle lands of China. During his lifetime, Sun Zi not only accomplished illustrious military exploits, but also passed down precious theories of military art, especially the treatise The Art of War, which in only 13 chapters and 5,000 words fully reflected his military philosophy. “The Art of War” covers almost all military theories such as strategy, psychology, meteorology, and topography. In addition, it also includes politics, economics, history, philosophy, literature, and the natural sciences. Therefore, after its publication, Chinese politicians, strategists, philosophers, and writers referred to it and treated it as an important piece of military strategy. Notably, it also spread to the world. As early as the Tang Dynasty, it was known and read by the Japanese. Today, the theories and ideas of The Art of War are often used in the decision-making process of modern business and social management. According to The Art of War, the highest state of military forces readiness is “to conquer other armies without fighting,” meaning that the greatest victory is one achieved without using a single soldier. In addition, Sun Zi warned kings and generals of nations not to go to war out of anger. From his point of view, people should think twice before starting a war and make a decision based on the interests of their own nations. The Art of War is widely considered a book about winning in battle. However, it is also a book that teaches people to understand that the purpose of using military force is to keep people from suffering turmoil and to encourage peace. Furthermore, advocates of war could be enlightened by the theories of The Art of War understand the true meaning of life, and finally put down their weapons. From the teachings of the book, people in history came to understand how to advance their lives by improving virtue, and kings and courtiers learned how to manage national affairs through virtue. Today, leaders from all walks of life use “The Art of War” as a guide for strategy and leadership.